The purpose of this article is to describe an alternate approach to analyzing the colors produced by your camera. Do not confuse this calibration with the functions of ICC color profiles. This article assumes that the reader is familiar with Adobe Photoshop CS and with using the Adobe Camera Raw tool (ACR). This is not an attempt to teach everything about ACR. Let’s go. This is a recap of my calibration efforts with two cameras. These are a Nikon D1X and a Kodak DCS Pro SLR/n. There are four steps to the process and we need to spend some time on each. These are: selecting a color target and matching image, shooting an image with your camera, analyzing the differences between the target and your image, and adjusting for any problems you might find. There are lots of color targets for sale in photography stores and many of them have matching image files available on the net. The nice thing about standards is that there are so many to chose from. Some have thousands of color patches. These are only useful if you are using instrumentation such as a densometer. They are excellent for building color profiles, but useless for visual examination. Others use colorful subjects and scenes. These are interesting, but there is no scientific way to quantify the actual color values. 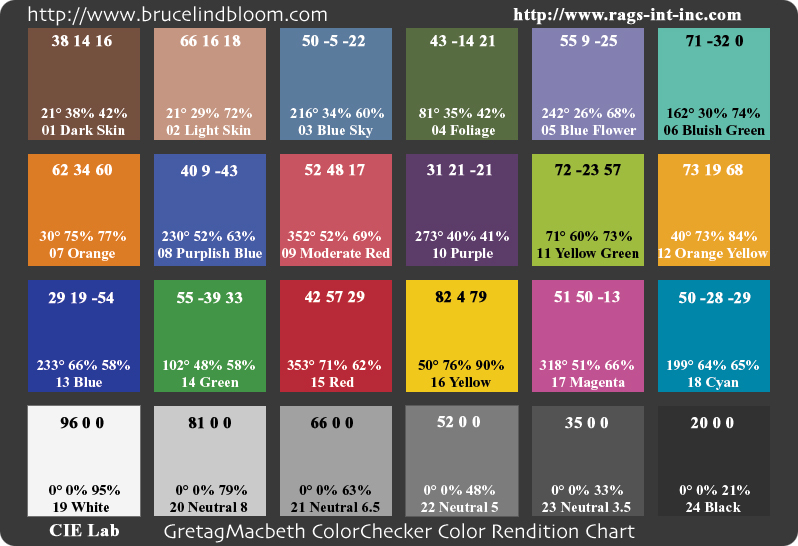 So I chose and recommend the GretagMacbeth Color Checker. This has only 24 color patches, each is labeled, and the manufacturer documents the color values. So, it is both comprehensive and simple. Unfortunately, GretagMacbeth provides two sets of numbers, one in CIE xyY encoding and another in RGB encoding. You can’t enter the CIE xyY numbers into Adobe Photoshop, it only accepts CIE Lab. The RGB numbers are given without identifying a color space, so they are technically meaningless. I tried several different CIE xyY to CIE Lab calculators and got inconsistent results. This was disheartening. I believe that the answer is that CIE xyY measures chromatic (light) values while CIE Lab is adjusted for visual responses. Lab is a color space, xyY is not. One thing I was able to prove was that the two sets of numbers provided by Macbeth do not correlate. More on this in a moment. To make a long story short, I wound up with two different image targets. One that I built using the RGB numbers in Adobe RGB color space, and the other from Bruce Lindbloom’s excellent web site. The CIE Lab numbers he uses are very close to the CIE xyY transforms that I tried. I will refer to differences between these as CIE image verses the RGB image. This does not refer to transforming numbers, it refers to two different sets of numbers. Reviewing these images in Photoshop reveals the facts that the Macbeth RGB values are significantly more saturated and have more contrast than the Macbeth CIE values. See this for yourself below. The RGB numbers produced an image that is much closer to the actual paper target under good lighting and viewing conditions. The CIE numbers clearly produce a muddy image lacking in punch and pizzazz. Both of these images show their respective CIE or RGB values, the corresponding hue, saturation and luminescence values, and the corresponding patch number and name. In the CIE target on the left, the HSB numbers are from the Photoshop Info pallet. Since it looked more visually correct, my first attempts at calibration were with the RGB target on the right. Eventually, I figured out what is wrong with this approach. Since many of the colors and luminescence values are fully saturated, there is no wiggle room for tonal adjustments. The slightly dim and undersaturated image target values are the ones you want to use. The target values for each channel in this image are achievable without clipping either the shadow or highlight details. In other words, no channel reaches an RGB value of 0 or 255. You can make your own decisions as to what you want to use for your image target. A single industry standard image does not exist. Just remember; garbage in, garbage out. I chose Bruce Lindbloom’s CIE Lab target image with some very minor alterations. First, I added the text showing the reference values, simply for convenience. Next, I added a new layer that neutralized the target values in patches 19 and 22. This is a nit, but if we are using the bottom line to validate white balance we don’t want any color cast in any of the target neutral patches. Finally and most important, I then converted this image target from CIE Lab to Adobe RGB with Photoshop. Adobe RGB is my working color space. The conversion is done with "Relative Colorimetric" intent and black point compensation. BPC on or off made no difference. I can only assume that this is because there is no true black (0) in this image. Then I recorded the RGB and HSB values in this new image. This modified target image is available via FTP here as CIE Lab or as Adobe RGB. Both are PSD files at about 2.5 MB each. 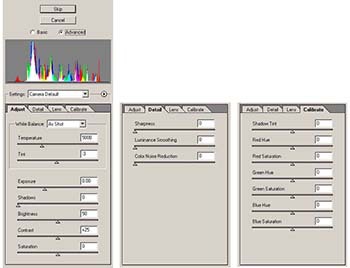 The CIE Lab image can be converted with Photoshop to any color space you desire to determine the correct target values for that profile. You want your target image values to be in the same color space that you use for the calibration. Eventually, I converted the same CIE Lab image to ProPhoto RGB and several other profiles. The RGB values are different (as expected). This is proper color management. The next step is to shoot an evaluation image with your camera. Whatever you do, don’t just set the exposure mode to P (for professional) and shoot away. You want to reproduce a correctly exposed flat image for a technical evaluation. You need to spend a few minutes on this. First, make a flat board to place the Macbeth target on. This needs to be a non-reflecting neutral gray that is darker than the white and lighter than the black in the target. You do not want to introduce any background tones that can interfere with the calibration efforts. Make sure that there are no strong shadows introduced by the light source. These can easily be darker that the black patch. In my daylight setup I used a reflector to fill the shadows. Pick your ISO and other favorite settings. Then, set your exposure manually using a reference gray card. No form of automatic exposure will get it right with this target. Checking for blown highlights is a good idea, there should be none. Adjusting the exposure to fit some pre-conceived notion of a histogram is a bad idea. Set your white balance as you normally would for the lighting conditions. Use auto, or daylight, or whatever floats your boat. With my D1X auto is fine. My Kodak SLR/n seems to be a little more finicky. Then again, I've only had it for a week now. Some D100 users seem to find that auto never gives them satisfactory results. Just don’t ignore the white balance. Don’t forget to focus. Then, take your best shot. Don't let the chart fill the frame. Some lenses may vignette near the edges or corners. Bracket the shot if you are unsure of your exposure skills. Copy the image to your computer and you’re ready to evaluate it. It took a while to understand and appreciate the relationship between the exposure, brightness, and contrast sliders. The answer is that all the basic adjustments revolve around a mid-point determined by the brightness slider. This is the center point of the contrast adjustment for example. Adjusting the exposure slider will move the mid-point and all related adjustments as well as the highlights. Thus, the proper setting for brightness is dependent on a proper exposure in the first place. That said, some cameras allow exposure settings as fine as 1/3 stop, and some are limited to 1/2 stop. Thus, the proper exposure for calibration might vary by 1/4 or 1/6 of a stop. If you find yourself tempted to alter the exposure by more than this, either the brightness setting is wrong or you need to re-evaluate your camera's exposure settings. After evaluating several images with different lighting conditions and different cameras, I was able to confirm to my own satisfaction that the brightness setting is different for the different cameras, but for a given camera, it does not vary with different but correct exposures. It finally became clear. The brightness slider should be set to agree with a photo gray card (18% reflectance). Your camera meter or hand held meter is calibrated to the gray card mid-point. There are slight variations in the photo gray cards from various manufacturers, but they are all close enough to each other to give consistent exposure readings. On a Macbeth Color Checker patch 22 (row 4, column 4) is technically photographic middle gray. In my tests, it is identical to the Kodak gray card. This is the target we need to match from a proper exposure, not the highlights or shadows. The proper exposure for calibration should be based on correct camera settings, not exposure adjustments in the ACR settings. If the brightness slider default is incorrect for your camera, you will naturally be tempted to adjust the exposure slider. The proper setting for the brightness slider should be based on a properly exposed image, not the other way around. If you adjust the exposure slider for your calibration image, all other settings will be incorrect for your properly exposed images. 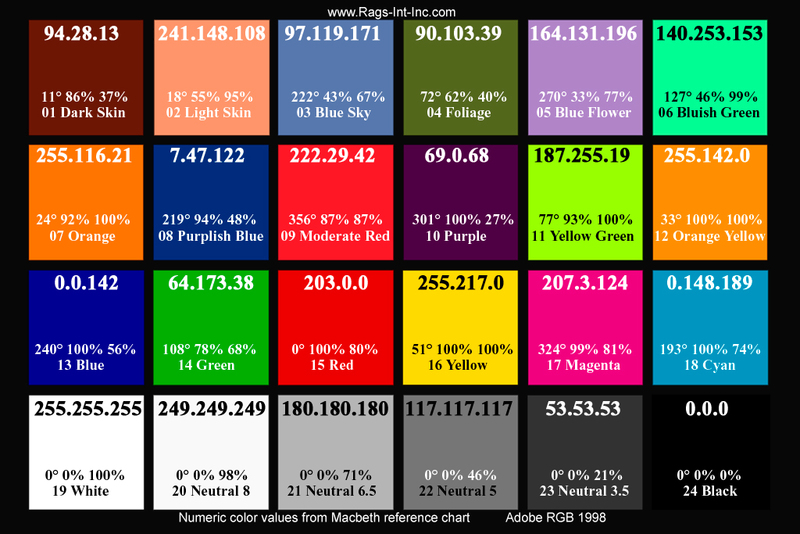 It seems reasonable to assume that photo gray (Zone V) should register RGB 127.5 (50% density). This is not exactly what happens. The target values in the Macbeth chart are incorrectly defined with the CIE values at 52%, not 50% luminescense. Note that patch 22 is labeled "Neutral 5", clearly the Zone V mid-point. In addition, converting the RAW image to a colorimetric space shifts the mid tones. How much depends on the selected color profile. Problem? Yes, because ACR contrast affects anything that is not at the mid-point for the current profile. If the brightness setting is wrong, the contrast and all tones will be skewed. So I am proposing a different basic calibration procedure. Technically, the brightness slider shuld be used to set patch 22 to 127 for Adobe RGB or sRGB or to 110 for ProPhoto or ColorMatch RGB. The actual target values in the current reference image are 105 (ppRGB) or 123 (aRGB). These are the values we need to use unless we recalculate the values in all the other patches for the target image. If there is a significant colorcast use the white balance eyedropper to neutralize it. You can set the contrast and saturation to zero if you like. Usually, this is not necessary. With brightness set for patch 22 at the mid-point, adjust the contrast to balance patches 21 through 23. You should observe that patch 22 will not change substantially no matter how much you adjust contrast. Note that patches 21 and 23 are equally distant in terms of tonal values from patch 22. That is, density 3.5 and 6.5 are both 1.5 from the center density of 5. Patches 20 through 23 should now be in balance and reasonably on target. Patches 19 and 24 do not have their densities defined, thus they should be ignored at this time. This figure illustrates the problem. Adobe has a very precise and carefully crafted quasi 16-bit digital mid-point value. Unfortunately, it is not aligned with the Macbeth target for photographic Zone V. Nor is the 8-bit mid-point. And the true tonal mid point depends on the color profile selected. I performed the same steps with a similar images from my Nikon and Kodak cameras. The contrast setting was similar for both. The Kodak brightness setting was half of that required for the D1X. Both images are now on target and balanced. The white patch is a little lower than the target suggests, but it reads the same from both cameras. Possibly the white values for the target are a little optimistic? It is curious to note that the white point for this target is almost identical in all profiles but the mid points and shadows vary immensely. Speaking of shadows, the shadow slider may be adjusted at this time. This is pretty straight forward, to bring the shadows value (patch 24) down if it is too high. Note that the slider stops at zero, so it is impossible to raise the shadow value if it is too low. That would usually indicate a problem with the contrast setting. Your camera's ACR brightness default setting should match a properly exposed Kodak Gray card or Macbeth patch 22 reading at the mid-point for your default color profile. Anything else is a subjective adjustment. The Color Checker target values are slightly lower, so the brightness slider will need a unique adjustment for the calibration steps only. For your normal workflow, you may wish to increase the brightness default by 5% to 10%. To recap the point raised here, the brightness control is designed such that it will compress, not clip, existing highlights or shadows. The exposure, contrast, and shadow controls can result in clipping. Exposure and shadow adjustments will also affect the mid-point around which contrast revolves. The brightness control should be calibrated to a proper exposure with your camera. The other controls are appropriate for specific individual images to fine tune exposure and contrast for specific scenes. Once the brightness setting has been established, it should be treated as a static control. Individual images may be subject to exposure adjustments for technical or aesthetic reasons. Contrast adjustments may be dictated by differences in the dynamic range of a scene. Other adjustments may be applied for artistic control. But, the brightness setting should seldom need further adjustments. Before making any color adjustments one should analyze the image and determine what if anything you want to adjust. Here is the calibration image I shot with my Nikon D1X. Mid morning outdoors shot with few clouds in the sky. Shooting data: ISO 125, f/8, 1/640, Auto WB, Adobe RBG, and NEF raw. This was opened in ACR with the “Camera Defaults”. Basically that was all sliders at zero with the following exceptions: WB is “As Shot”, Brightness 50, and Contrast +25. I examined several of the numeric patch values and saved it without any adjustments so that I could record the values for this article. These were the Adobe defaults. I have since changed these camera defaults. For this D1X the changes were minor. The image follows. As you can see, this does not look anything like the Macbeth RGB target image. But the appearance and numbers are surprisingly close to the Macbeth CIE target values. Even the white balance is right on. You can’t use the eyedropper on any patch in the last row without un-neutralizing some other patch. Note that the eyedropper will show slight variations in the actual numbers within the patch. These numbers (above) do represent the average values. This was not true with my Kodak SLR/n image. Both the neutral tones and the colors were far off the target values. But, after correcting the brightness, contrast, and saturation defaults, the Kodak colors were much closer to the target values, and starting to look like the D1X image. This demonstrates why getting the exposure right the first time is so important. It also illustrates the possibility that the ACR basic defaults can introduce significant errors. I can’t say this often enough. Start with a proper exposure and the proper defaults for the ACR basic settings. Photographers and film labs have treated development and printing as discretely separate steps from the beginning. ACR is the developing step. Photoshop is the printing step. The final image colors are based more on viewer preferences than the image capture science behind them. Of course we do want the camera and the software to give us accurate tonal renditions to start with. After several false starts, I finally did get the colors for both cameras to match each other and the target. I am not going to address the details of the color calibration here. The basic objective is to balance six slider settings to calibrate hue and saturation in the red, green, and blue patches. Among the challenges, the information displays do not show HSB metrics requiring the user to do these calculations on the fly. And these adjustments also change the luminosity of the colors. This is a task that requires some automation assistance. I will address this in the tools below. I finally have confidence in my ACR camera defaults. And, I finally have the color calibration under control. I tried these settings with some random portrait, sports, and wildlife photos. All showed improvement to my perception. Do not attempt color calibration unless you are willing and able to invest the time and effort to do it right. Without the effort, you are more likely to screw it up than fix anything. 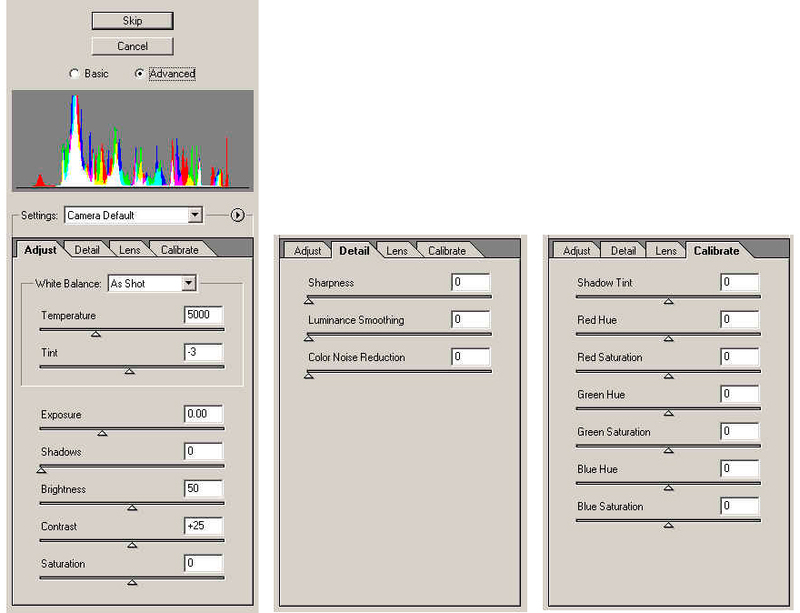 Select a digital image target in the right color space and record all the RGB and HSB values for reference. Naturally, this also has to match your reference paper target. Shoot your evaluation image with the correct exposure and white balance. That’s the only valid starting point. The script above can help with numeric analysis of the tones. Select your color target and matching image file. Expose properly for your calibration image. Analyze with diligence. Don’t rely on your vision only. Don't assume that you will achieve perfection. All adjustments are based on a proper mid-point (brightness setting) and the proper contrast adjustment. I finally did try unique calibrations for tungsten, fluorescent, flash, shade, and clouds. That’s what essentially what white balance settings are for. I found that the basic settings remained essentially the same. The color settings for tungsten lighting do vary enough to warrent a seperate calibration. But there is so much color variance in tungsten and fluorescent lighting that reliable calibration for all such light sources is almost impossible. The color settings for flash, shade, and clouds seem to track the daylight settings nicely. Your mileage may vary. Different manufacturer, different model, different settings, different preferences, and a unique piece of hardware. For any camera, calibrating the sliders on the ACR basic tab can yield a huge payback. 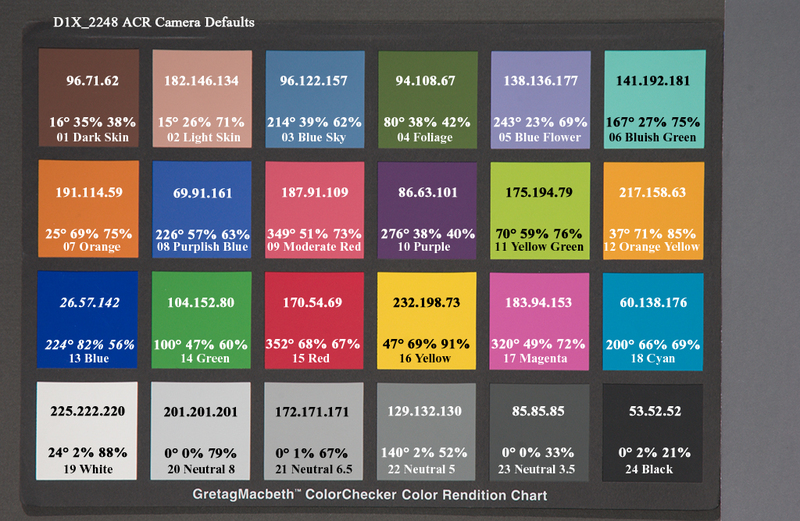 For cameras that are officially supported by ACR, my humble opinion is that color calibration should be unnecessary. Unfortunately it seems to be always necessary. There is good write-up on ACR basics at Digital Photo Outback. 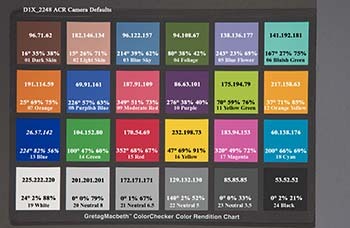 If you want to read other articles about ACR Color Calibration, see Bruce Fraser’s article at creativepro.com. Adobe, please show the HSB values in the ACR preview window. After you have calibrated any tonal adjustments deemed necessary, you can adjust the brightness, contrast, shadows, and saturation defaults to produce the image you really want to see. If you make the aesthetic adjustments first, you will hamper the calibration efforts.